Communication senior Hale McSharry addresses students gathered at the Lakefill. 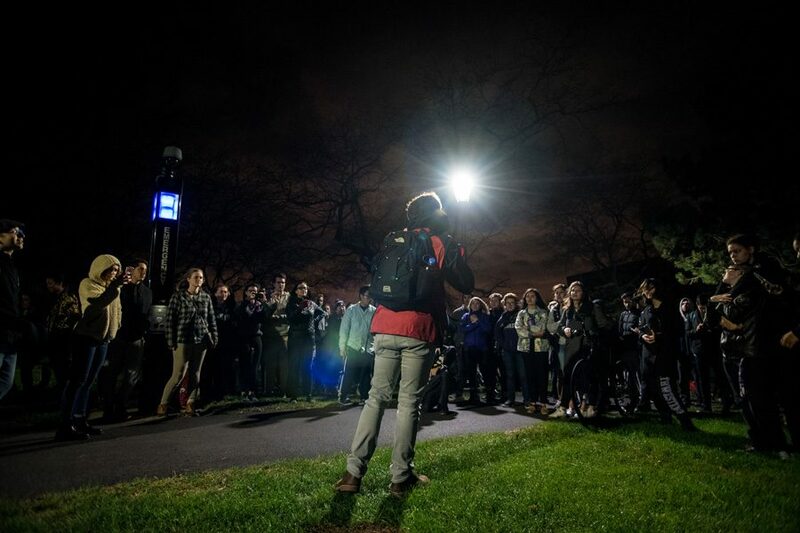 The student-organized event aimed to provide a space where students could express opinions and comfort one another as the election drew to a close. Tuesday did not go as planned. All day, many students snapped voting selfies and stood in virtual solidarity as Hillary Clinton was poised to become the first woman president of the United States. Donald Trump yard signs — which sprouted on lawns and roadsides throughout the country — seemed just about nonexistent on Northwestern’s campus. As the polling results began to stream in, many residents in Evanston were confident that Clinton would win. It wasn’t until about 9 p.m. that reality began to sink in. It was a reality almost nobody saw coming: Trump was going to become the next president. By 2 a.m., it was clear. He is the president-elect. “We were watching the percentage likelihood of Donald Trump winning climb, and it came off as a joke. I still think it’s a joke,” said Tristan Litre, a Weinberg junior who helped plan a gathering at the Lakefill after it became apparent that Trump was going to win the election. NU students gathered at events across campus Tuesday night, both to watch the election results pour in and celebrate a historic moment in U.S. history. It just didn’t end up being the moment many thought they were about to witness. Stucky, who voted for Trump, said he wanted Trump to win but added that he is worried because he does not know what he will be like as president. “I’m anxious to see what he will do, but I’m glad that we won’t have to find out what Hillary would do,” Stucky said. Most students did not seem to share Stucky’s sentiment. Several said they were worried, disappointed and even “terrified” by the prospect of a Trump presidency. They expressed concern about Trump’s policy proposals, his campaign rhetoric and the effect his election will have on minority groups in the United States. Aaron Lewis, a former Daily staffer, was one such student. The Medill sophomore said Trump’s win is likely to result in negative consequences for people of color, including himself. SESP sophomore Cate Ettinger, a former Daily columnist, said she has never felt as terrified as she did Tuesday night. She called the election results a “disgrace” and said she was overcome with anxiety and disappointment. International students were also feeling the effects of a Trump presidency. Weinberg senior Erica Zou, a student from Hong Kong, expressed concern over Trump’s comments to take away the H-1B, a non-immigrant visa, and said his presidency could have severe repercussions for international students in the future. Communication senior Hale McSharry spoke to a group of students at the Lakefill and said young people need to show love for one another. “We need to step up to the plate tomorrow to protect our people of color, our friends, our citizens of America … who are endangered by this happening because the evil is emboldened after this,” he said. Associated Student Government President Christina Cilento, a SESP senior, said ASG plans to send an email to University President Morton Schapiro and other administrators Wednesday requesting more staff from Counseling and Psychological Services, healing spaces for students and leniency with class absences and late assignments. Cilento said ASG also plans on holding an event Wednesday for students to gather and heal. She added that she saw several students crying throughout Norris University Center on Tuesday night. McCormick junior Vyas Alwar said he is trying to reassure himself that everything will be OK. However, he said part of him is imagining a “doomsday scenario” under which Trump would repeal Obamacare and go to war with other nations. “I’m still not sure what the plan is going forward for young liberals like me because now we have essentially no voice in the federal government,” Alwar said. Stavros Agorakis, Allyson Chiu, Jonah Dylan and Yvonne Kim contributed reporting.